1 JOHN 5:7 KJV "For there are three that bear record in heaven, the Father, the Word, and the Holy Ghost: and these three are one." 4For whatsoever is born of God overcometh the world: and this is the victory that overcometh the world, even our faith. 5Who is he that overcometh the world, but he that believeth that Jesus is the Son of God? 6This is he that came by water and blood, even Jesus Christ; not by water only, but by water and blood. And it is the Spirit that beareth witness, because the Spirit is truth. 7For there are three that bear record in heaven, the Father, the Word, and the Holy Ghost: and these three are one. 8And there are three that bear witness in earth, the Spirit, and the water, and the blood: and these three agree in one. 9If we receive the witness of men, the witness of God is greater: for this is the witness of God which he hath testified of his Son. 10He that believeth on the Son of God hath the witness in himself: he that believeth not God hath made him a liar; because he believeth not the record that God gave of his Son. 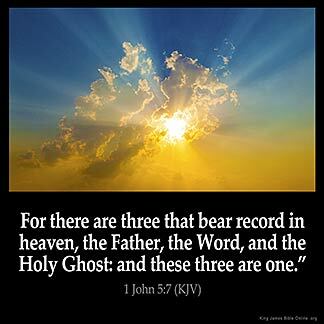 For there are three that beare record in heauen, the Father, the Word, and the holy Ghost: and these three are one. For there are three that bear testimony in heaven, the Father, the Word, and the Holy Spirit, and these three are one. For thre ben, that yyuen witnessing in heuene, the Fadir, the Sone, and the Hooli Goost; and these thre ben oon. 5:7 What Bengelius has advanced, both concerning the transposition of these two verses, and the authority of the controverted verse, partly in his Gnomon, and partly in his Apparatus Criticus, will abundantly satisfy any impartial person. For there are three that testify - Literally, testifying, or bearing witness. The participle is put for the noun witnesses, to intimate that the act of testifying, and the effect of it, are continually present. Properly, persons only can testify; and that three are described testifying on earth, as if they were persons, is elegantly subservient to the three persons testifying in heaven. The Spirit - In the word, confirmed by miracles. The water - Of baptism, wherein we are dedicated to the Son, (with the Father and Spirit,) typifying his spotless purity, and the inward purifying of our nature. And the blood - Represented in the Lord's supper, and applied to the consciences of believer. And these three harmoniously agree in one - In bearing the same testimony, - that Jesus Christ is the divine, the complete, the only Saviour of the world. 1Jo 5:7 There are three that bear record in heaven, etc. This verse is not found in the Revised Version or in any ancient MS. It is no doubt an interpolation. I still see so many differences on the question as to who is the father of Jesus.If he was born in in the same manner as everyone else.The virgin Mary by being the mother by immaculete conception issue still leaves the question open. The Holy Trinity is in the very centre of our Christian faith. In this verse, we learn that there is one God "these three are one" , in three divine persons "the Father, the Word, and the Holy Ghost" . The Father, who sends His only-begotten Son to the world for our salvation. The Word cf. St. John 1:1 : that is, the Son of God, Jesus Christ, who is truly God and truly man. He took upon himself the human flesh, so that in the flesh He might suffer for us the cruel death on the Cross, by which we are saved. The Holy Ghost, who is the giver of life, and proceeds from the Father and the Son. This is a great mystery of our faith, that we can meditate upon day after day. Jesus was asked by Philip to, "Shew us the Father. " Jesus saith unto him, Have I been so long time with you, and yet hast thou not known me, Philip? he that hath seen me hath seen the Father and how sayest thou then, Shew us the Father? God also says there is no god beside him and he will not share his glory with another. HE is ONE God, Father in creation, he became the son when he dwelled in the body he created, and he is the Holy Spirit. ONE GOD. One Lord, one faith, one baptism. The Bible is full of the oneness of God. It does not teach trinity.